By Edna Seward Stevens, born 1878, Wellesley Class of 1900. Original Photographs, Presented Here Anachronistically, from Stevens Family Archives; Used with Permission. An Old and Dear Friend, and Granddaughter of Author Edna Seward Stevens, Sally Stevens at Connecticut's Sachems Head Yacht Club (founded by her great-grandfather). Although Sachems Head is a small place, studying her history is a large task. I began to collect information from various sources and to concentrate on what I, myself, could recall. I was more than glad that I had given myself the privilege of unearthing so much that was interesting to me and that I hope will be worth the attention of those of you who are here this afternoon. I have not had to do much digging up of records as that has been done so thoroughly by Mrs. Henry B. Griswold. Some of the results of her efforts have been published from time to time in the local papers to which I had access. Some of them I was fortunate enough to find laid away among my own treasures. You will have to excuse personalities from time to time which may enter into my talk. Sachems Head is part of my life - I belong there. I started going to Rock Bound when I was five weeks old and I am quite sure that I am about the oldest summer resident reckoned in terms of seasons spent at Sachems Head - so - I speak with the authority which age confers. I shall divide my talk into two main parts - one I shall call ‘History’ - the other “personal recollections.” The History may be authenticated - the recollections will have to be taken with due regard to the possibility of error in human memory, and to bias of one to whom every foot of the shore is clothed with memories that are a vital part of a very happy life. I am sure that my father, myself and my sons are something of what we are because of Sachems Head. Well, like my father, I am beginning to be sentimental I see, as I’ll revert to historical facts which in this case I am sure you will find far from dry. Practically all of what we now know as Sachems Head was once called “The Great Ox Pasture.” The name “Sachems Head” came from the fact that, in 1637, a great Indian chief was beheaded after a fierce battle between two hostile tribes of Indians and his head placed in the fork of an old Oak Tree on the north side of the harbor. This is information given by our historian. However, as long as I can remember, there was a large pole on Chimney Corner about where the Yacht Club flag pole stands now and that pole was always pointed out as the one which the Sachem’s head had been hung. Personally, I rather like to think that I saw that bloody pole, tho I am compelled to believe that the historical version is the correct one. The name “Sachems Head” was not used until 1830. In Mrs. Griswold’s paper called “The Great Ox Pasture” written in the fall of 1919, she has told many details in regard to ownership of the land and the families who lived here long ago. The first inhabitants were of course the Indians. Walter Davis has a fine collection of arrowheads which have been dug up around here from time to time. Then, there are, or were, people who knew Indians who belonged here. It is told on good authority that two Indians lived in the cave under the high rocks on Mr Dan’l Spencer’s land which we pass going in to Shaumpishuh Farm. In the year 1728, the acreage of the Great Ox Pasture was divided in the “Fifth Division of Land.” Each patentee received about 20 acres. It is thought that at one time the whole of the Great Ox Pasture was fenced in. The first white settler to build here was Jordan Leete. He moved here about 1750. He was a great grandson of Mr. William Leete. Jordan Leete inherited the land from his father. He kept adding to his property by purchase and exchange of land until he owned about 100 acres. He was married in 1746 and probably came to Sachems Head about that time. We have reason to think that Jordan Leete’s home stood on the site of the old hotel and the land across the street from the present Post Office. In the year 1762 Edmund Ward bought land and built a house where Mr. Edward Eliot now lives. In fact Mr. Ward’s home was the beginning of the present house so that that house, with its beautiful trees, is the oldest home on Sachems Head. Later on this home was called the Caldwell Place as Mr. Ward’s married daughter Mrs. Nathaniel Caldwell lived there. In 1777, Solomon Leete, brother of Jordan, was living in the house he probably bought from his brother’s estate. On June 17 of that year, a party of British sailors landed on the beach nearby under cover of fog and burned the house with most of its contents. This was probably in reprisal for damage a party from Guilford under Jonathan Meigs had done a short time before. The story is that in less than 24 hours time this little band went from Guilford to Sag Harbor & return, captured nearly 100 prisoners, destroyed vessels & took possession of a quantity of supplies. Those of us who are sailors will realize that there must have been unusually strong tides and winds favoring the raiding party both ways. I was talking recently with a granddaughter of Daniel Leete, grandson of Solomon. She told me that her mother had often spoken of hearing her family tell of the destruction of Solomon’s house and of how the family put a feather bed into an ox cart and transported Mrs. Solomon Leete, who was very stout, up to Guilford out of danger. Doubtless some household goods went with her. However Solomon put in a claim to the General Assembly for reimbursement to the amount of 1044 pounds 15 shillings, 2 pence. He was granted half of his claim. The list of his goods is in Hartford now. His house was 30 ft. wide 40 ft. deep. These are some of the things listed as lost. “a coffee mill value 10 s - Six basons of puter six porringers ‘do” 12 cream colored plates, 7 beds and bedstead, 2 pillows, 2 great coats, 1 sunbonnet, 9 woolen gowns, 4 pr leather breeches, 2 cloth breeches, 8 shirts, 1 pr gold buttons, 12 pairs shoes, 1 silver shoe buckle, 6 pr trousers and 2 more woolen gowns, riding hood, 1 sateen visiter, 1 pr cotton stockings 8 pr woolen stockings, 12 caps, a gauze handkerchief, 12 divinity books, 2 punch bowls, 2 dram cases, 12 bottles, 2 hogsheads, 6 barrels, 1 mare, 4 goslings, 4 prime hogs, 8 shoats, 3 calves weaned. 1 bbl. Salt pork 1 bbl beef. 26 hi wheat, 8 hi oats 600 pound ‘ flour.” 4 hi Indian meal, 6 hi corn, 7 hi. Oatmeal, 3 pr spectacles. The British must have had a good feast. In 1803 there were five homesteads in the Great Ox Pasture. Solomon Leete had five sons and two daughters. Thomas Leete built the present Dan Walden home, formerly owned by Samuel Barker father of Ernest and Wesley Barker. Pharez Leete lived in the home his father rebuilt. Elijah Leete built near the present Newhall home. The remains of that house were easily seen when I was a child. While on the subject of graveyards I must not forget to mention the burying ground which was back of the present hotel. The tombstones were removed to Alderbrook Cemetery and the graves are overgrown. Mrs. Botsford, a grandaughter of Dan’l Brown Leete, told me that relatives of hers are buried there. The sailor’s grave on the north side of the harbor was covered when the quarry was in operation. Another Leete built a house that overlooked Great Harbor. We know what remains of it as the Old Benton Homestead. It was in the year 1811 that Daniel L. Benton moved his family from Nut Plains to this house. Dan’l Benton (his son), father of Charles & Edward & Herbert Benton, was only two years old when he came to Sachems Head to live. (Charles adopted the present Young Charlie, nephew of his wife and gave him his name) Herbert was father of Elliot Benton) That house was on the lane (then a regular road) that leads from Uncas Road near Mrs. Daboll’s back along Great Harbor finally joining the next road to Sachems Head near Richard Benton (north of him) It is said that Mr. Dan’l Benton could remember having seen British sailors land on Fosdick Island and take away sheep that were pastured there. Fosdick Island is what we called “Horse Island” in Great Harbor where clammers dig - Richard Benton, father of present Richard, Mattie and Hattie Benton was a brother of Dan’l. He built the house where his son Richard lives now and started to build the house where Eliot Benton lives. A brother John bought that house. When Dan’l Benton was married he left the home on Great Harbor and built the house where Young Charlie Benton lives now. Charlie’s foster father Charles and Uncle “Eddie” lived there until they died. Mrs. Dan’l Benton told me that when she came there to live she did all of her cooking in the brick oven & fireplace that are still part of the house. She lived to be over ninety years old. One house in which many of us have been interested and which no longer stands is one known to us as the “Roberts House.” In 1805, George Kimberly bought land and built that house. His son was Keeper of Faulkner’s Light from 1818-1851. This house stood about at [the] driveway into Mrs. Kalbfleish’s house. A nephew of George Kimberly’s wife bought the Solomon Leete home on site of [the] “old hotel” from Pharez Leete. The little house across the road of Charlie Benton’s house was built by Eli Kircum who left a toll gate there. Later Dan’l Benton bought it and lived there while he was building the home across the road. Walter Davis’ house was owned by a Mrs. Beech, a sister of Mrs. John Barker and aunt of Walter’s. Mention of a toll gate brings us to the era of the ‘old hotel’ when Sachems Head was called the “Newport of Connecticut.” The house originally built by Solomon Leete passed through various hands until it became the property of the Griffing family. In the year 1795, the State of Connecticut began to incorporate turnpikes. Up to this time the roads through the state had been few and poor. Now, many more were built and greatly improved. Their upkeep was under state supervision. Alert Guilford men thought that a turnpike would be of great benefit to the town financially. These men fostered the idea - Sam’l Eliot, Joel Tuttle and Frederick Griffing. They planned to have steamers dock at Sachems Head when the Conn. River was not navigable and to have the steamers met by a line of stage coaches running between Hartford and Sachems Head. The turnpike was built about 1825 and was laid out and built by the state legislature. I am quoting now from Mrs. Griswold’s paper. “It began at a rock in Sachems Head Harbor and continued sometimes on the old layout sometimes on the new until it joined the New Haven and Durham Turnpike in Durham. The new layout avoided the old Ox Pasture road (along Great Harbor) from the Edw. Eliot home to the foot of Lindly Benton’s hill and built the new road past the schoolhouse joining the old road at the foot of said hill and wound up the narrow wooded hill road which the railroad crossed just west of Sachems Head Depot and which was abandoned after the building of the present road through Long Cove in 1880.” There was a little branch of this road (old) which crossed the beach by a bridge instead of the grade crossing. Careful people were afraid of the road over the tracks. The road from Mulberry Bridge into Guilford was also new as the old road went around by Jacobs’. The coaches went from the Green up through Church Street instead of on the old Durham Road which is now State Street. The “old hotel” was built to fill the need of shelter where the steamboat met the stagecoach. The old Solomon Leete house, then owned by the Griffing Family, filled the need and was improved to meet the demands of a hotel. In 1835, the manager advertised in the Hartford Courant that the hotel was accessible by steamers of the New Haven, Norwich line and by the New York-Hartford line - while stages would meet the New York Hartford line at New Haven. Mr. Wildman the manager, pledged himself to spare no exertion to make it agreeable to any who might favor him with their company - Sachems Head was, even then, one hundred years ago, a popular resort for people from Hartford. The poetess Lydia H. Sigourney wrote in high praise of its natural beauties as early as 1848. The early hotel consisted of the single west wing with accommodations for forty guests. Later a long east wing was added. When Mr. Scranton took over the hotel later on, he enlarged it so that it could accommodate four hundred guests. The entire lower floor of the new section was comprised of the new dining room which seated four hundred and of an immense parlor used as a ballroom. This room had a spring floor laid without nails. The ballroom was often used for devotional services on Sunday mornings. Mr. Scranton built spacious barns for in those days many guests brought their own horses, carriages and coachmen. He built bath houses for “surf bathing” at Bloody Cove (Hotel Beach) and bath houses near what was known later as the Roberts property (Mrs. Kalbfleish & Milton Bullard) for hot water. He built greenhouses and a “grapery” and had the grounds laid out by a landscape gardener who planted the trees which now stand across from the Post Office. He bought the John Benton house (Eliot Benton’s) and hired a farmer to live there and raise produce for the hotel table. Mr. Scranton arranged with the New London Providence & Stonington R.R. for a new station, “Sachems Head” and ran a bus to and from the station. The forerunner of the old bus driven by Mr. Storey in which some of us have ridden many times. There was also a new dock where New York- Providence steamers landed passengers and freight. I am now going to quote from an article by Mrs. Henry B. Griswold in the Shore Line Times March 6, 1924. “One of the up to date features of the hotel was its telegraph service with the Tontine Hotel in New Haven - in those days a real luxury in communication. In this connection I remember that during a thunderstorm, lightning destroyed fourteen of the telegraph poles. My son remembers going down there to help his father who furnished new poles to replace those destroyed and seeing at that time Stephen A. Douglas, Lincoln’s opponent in the presidential race of 1860 promenading the hotel piazza with his wife. I remember the names and faces of many distinguished guests - the Astors - Vanderbilts and Harrimans from New York.” Among others Mrs. Griswold recalled were the Emersons of Boston and one woman named Mrs. Thorne who paid all the bills for a family of thirty including a pet dog which sat at the table and for which full price was paid. There were small tables in the dining room and an orchestra furnished music for dinner and for dancing in the evening. Advertisements of the hotel at that time claimed that there were no mosquitoes. This may have been true as the meadows were left ditched by the farmers for the sake of the salt hay. It’s interesting to wonder what Sachems Head would be like now if that hotel had remained and Sachems Head had continued to be the fashionable resort that it was in Civil War times. But this was not to be. In 1865 the hotel was destroyed by fire and was not rebuilt - The Cook house and washroom were not burned and were moved and attached to the east side of the old Barker House where Mr. George Sperry now lives. When I was a child, Mr. & Mrs. Edgar Davis, parents of Walter Davis, lived in that wing and Mrs. Davis’ father & mother, Mr. & Mrs. Barker, lived in the main part which was later remodeled by Mr. & Mrs. Wm. E. Peck. In 1878 the present hotel was built and was known as the “Barker House” until it became the property of Mr. George Sperry’s father. About this same time a few summer cottages were built. My father, Edward C. Seward built Rock Bound the year before the hotel was built. The Pierce cottage and the center part of the old Miner cottage were built soon after. Mr. Cowles of Plainville built that. Captain Brooks built the house on Vineyard Point now owned by Mr. Griffith of Hartford. He had been light house keeper at Faulkner’s Island for over thirty years. The house about which brings the aura of romance of a tragic nature is Shaumpishuh owned for many years by Mr. Thomas Landon of Guilford. This house was built by Dan’l Brown Leete, grandson of Elija Leete whose house was near the site of the Newhall Cottage. Dan’l Leete worked for a Mr. Trobridge of New Haven. He had charge of boats going from New Haven to Cuba with cattle and horses and returning with rum and molasses. This was told to me by Dan’l Leete’s grandaughter Miss Imogene Botsford. I have just discovered that the brother-in-law of Mrs. Floyd Wallace who is living at Shaumpishuh is a great grandson of that Mr. Trobridge. When Dan’l Leete’s sons were old enough, he mortgaged his house to buy or build a boat with which his sons might trade carrying goods to and from New York. On one trip an Oriental helper went with the two lads. They intended it to be their last trip with the boat and it was. The produce was disposed of, the boat sold, but retained for the trip home and the return journey started. The Leete boys never reached home. Later the helper was picked up out at sea by a ship which landed in New Jersey instead of New York which state held jurisdiction over the boat. There was every evidence that the two boys had been murdered. In those days it was hard to get justice done quickly where there was a question as to which state should be the scene of the trial. The helper was tried in New Jersey. Mrs. Leete and her two daughters went down. Mr. Leete’s mind was failing at that time. Nothing was done to punish the murderer. Later a body was washed up on the Long Island shore and a piece of the clothing was identified by the mother as belonging to her eldest son. The father would not admit the identification and the body was not claimed by the family. Dan’l Leete had lost his sons and all he owned, not even his house was his. Miss Botsford told me that Mr. Thomas Landon’s grandfather held mortgages on the house, but left the Leete family to live there as long as they needed the home - indeed he made provision for that in his will. 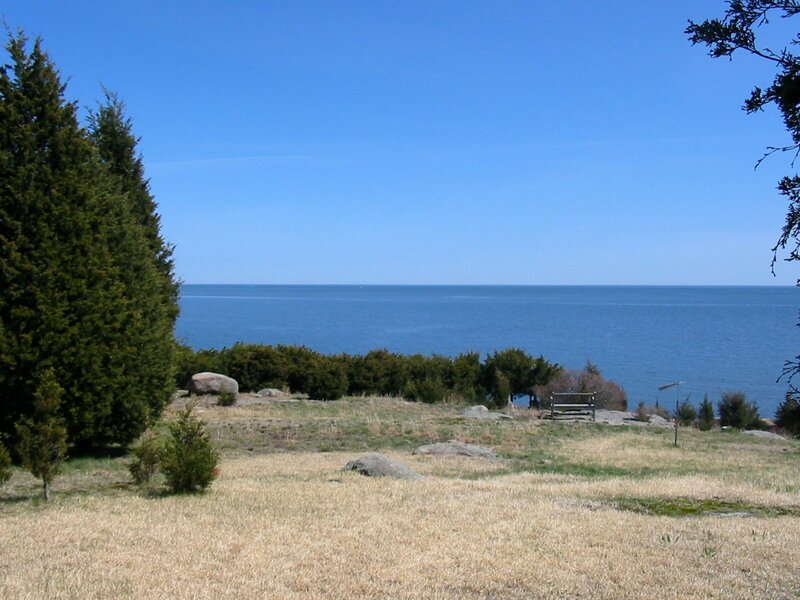 Probably the natural harbor at Sachems Head has been the main reason for its becoming again a summer resort. More and more people built cottages and had boats to be cared for. Of course if you have a boat and I have a boat the question arises, “Which is the faster?” That perfectly natural question was the reason for the forming of the present Yacht Club. In the summer of 1896 Aaron Hill owner of the Sachem John Elton Wayland owner of the Spindrift Edward C. Seward owner of the Sweetheart and William E. Peck owner of the Helena founded a yacht club of four members all officers in the order named - Commodore, vice commodore, Fleet Captain, Sec & Treas. On May 14, 1897 articles of association were adopted and Robert B. Seward elected to membership. Later Rob’t Mitchell, A. H. Wilcox, W. C. Clark (Leetes Island) C. N. Wayland (Mrs. Wayland’s father) Harry Bartholomew, Dr. Robert Lander and a Dr. Joseph Pullman were admitted. Races were started that year from Merriman’s dock. (Now Hoffman’s) Twelve boats started in the first race. The first annual regatta on Labor Day found seventeen boats entered. The first annual meeting of the club was held at the Pierce Cottage. Mr. Seward was appointed chairman of a committee to secure a club site. It is due to his efforts that Chimney Corner was acquired. Many who have bought property at Sachems Head in years past know that there are old titles reaching back almost to prehistoric times and that boundaries were much more loosely held than now. Securing title to that rocky island meant following up many families who seemed to have some claim to the rocks. A corporation was formed under state laws to finance the purchase of the site and building was begun. The Club House was formally opened June 18th 1898. Capt Oliver Brooks was the first superintendent. Membership has increased greatly since the early days but the interest and enthusiasm in regard to racing was never stronger than at that time when from twelve to twenty boats flying the yacht club flag used to cruise each summer - carrying the name and fame of the club to all points of importance east and west along the Sound. Those of us who lived here fifty years ago depended on horse-drawn vehicles or on rowboats for transportation to Guilford. In my early days we might hire horses from the livery housed in parts of the stables that once belonged to the old hotel. Mr. Cowles owned horses and a buckboard and so did Mr. Aaron Hull. Most of us carried water for drinking purposes from our own or a neighbor’s well and had rain barrels or cisterns connected to pumps in the kitchen. Every day Mr. George Norton drove down from Guilford from Landon & Davis store on the green and brought us the provisions we had ordered the day before. Meat and fish were peddled from carts and vegetables came from neighboring farmers - milk also - and chicken and eggs. If we needed something in the line of dry goods, Mr. Norton took samples or our order for pins and needles - and shopped for us at Edwin Griswolds or Shepherd and Fowler’s. We could not have managed a real comfortable existence without his cheerful helpfulness. He was still bringing groceries, but from his own store down here not so many years ago and acted as postmaster. We would consider sailing out to Goose Island in the evening to spend the night in a little open boat so as to be in time for early morning fishing. That is what I did many times with my father. Now an engine takes one out there in less time than it takes coffee to percolate. Our children should give us credit for being great swimmers in those days when bathing suits water soaked weighed more than our winter wardrobe today - yet we swam from the hotel to Hump Rock and even across to Razor Beach where Mr. Berger’s house now stands. That whole point was often used as a camping ground by Y.M.C.A. boys from New Haven and many baseball games were played there between the boys from the city and our summer residents. So many of the changes at Sachems Head are of such recent date that many of us who live here now can recall the various buildings and remodellings and removals that make this colony the most attractive place on the Connecticut shore. As I browsed around gathering data here and there I was more and more impressed with the fact that we have a great deal to boast of (if interesting history which our forefathers made is reason for us to boast). Some summer resorts boast of beautiful beaches - some of rocky bluffs, some of dunes, others of ocean waves. We have all of those on a small scale and, in addition, the faint ghostly sounds of Indian war dances and lullabies, of gay music from stringed instruments as guests from North and South danced together in the spacious ballroom of the old hotel. We listen carefully and can hear the creaking of ropes as sails are being lowered in vessels that have come from the West Indies with cargoes of rum and molasses and hear very faintly the whistles of the steamboats that brought gay parties from New York to the old hotel. Now, our harbor echoes with the sounds of rigging on pleasure craft, the noise of gasoline engines - the jazz from instruments in the Club House. Yet the sounds are similar. To some of us the sounds of the music are less sweet - perhaps because we are older and distance lends enchantment - distance of time as well as space. One of the best things about Sachems Head is that the epithet “Summer People” has lost its flavor of unpleasantness for the ties that bind those who live here three months to those who live here twelve are very close. In closing let me report one geologic aspect of our coast. Our shores are sinking! Geologists say so - we ourselves have seen the high water mark creep slowly inland very noticeably in the last twenty years. Be thankful, all of you who love Sachems Head, that our coast is rocky instead of sandy so that the day when we might have to locate our houses by red buoys may be put off as long as possible! thank you Muffy. this was a wonderful read! I'll second that. Thank you. And I third it! And I also enjoyed the old photos. Thank you. Interesting read and Sally is beautiful.